Starting a business can be frustrating and difficult. This is because there are so many tasks involved in the business starting process. A checklist is a great way to help ease some of the frustration and difficulty. Using a customizable new company checklist allows you have a visual idea of what is needed in order to get your business up and going. Customizing your checklist gives you the opportunity to include tasks that are relevant to your new company. This Microsoft Word template offers a way to get organized and get your new company started without delay. 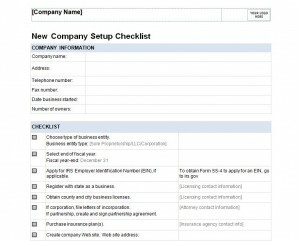 The first thing to do once you download the New Company Checklist is to customize it according to your business needs. Customize the form by adding necessary tasks to complete for your new business, add your company information (name, address, phone number, and email address) insert your company’s logo in the top right corner. Once the checklist has been customized it is now time to complete the tasks. Allow the checklist to be a reminder of certain tasks you have to perform in order to start your business. When you have completed a task, place a checkmark in the box that is to the left of each task. Completing all the tasks on the New Company Checklist is an indication that your business in now ready to officially open. If you are going in business with your partner, make sure that he or she also receives a copy of your customized New Company Checklist. This will help to make sure that you and your partner understand what goal you both are working toward. A second tip is to have more than one copy on hand just in case the original is lost. The New Company Checklist helps to remove the guesswork of what is needed to open a business. It can help to also reduce the stress associated with become a business owner. Save time and reduce stress by downloading your checklist today.